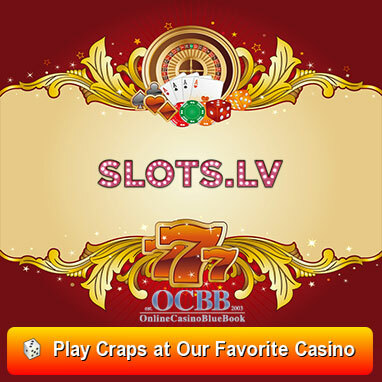 Craps is a dice table game that is highly popular in land-based casinos. 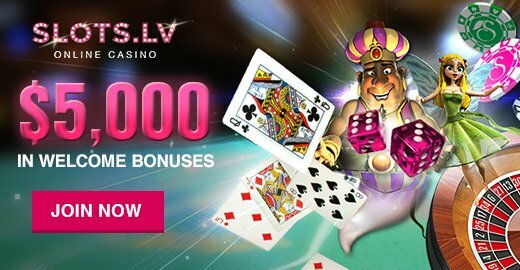 Although it can be played at online casinos, it is more fun and exciting at land-based casinos. Whenever you enter a land-based casino, you will find a table that has players around it screaming and yelling numbers — this is the Craps table. There are two types of Craps. One is casino craps, which can be found at casinos. In this game, players at the Craps table are all betting against the house or the casino, which is why it is entitled Casino Craps. The second kind is called Street Craps, which is where players play against each other — it used to be played in the streets and is why it is called Street Craps. Craps is a game of pure luck as it all depends on the dice and the numbers that are rolled. In this game, players will place wagers on the outcome of the two thrown dice. A a player will throw the dice and he is referred to as the shooter. After the dice are rolled, players will be paid according to the outcome. Some wagers need more than one roll, while other wagers can be settled after one roll. In this tutorial, we are going to discuss the payouts and the different wagers that can be placed at the Craps table as well as the rules players will have to follow while being at the table, among other important topics. 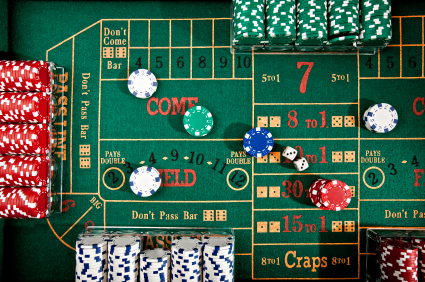 Evidence suggests Craps may have originated and evolved during the ancient Roman Empire. Roman soldiers used to carve the knuckles of pigs into cubes and would play with them by tossing them over their shields as a game while in camp. The term “To Roll the Bones” originated from here. Other theories claim Craps originated in the Middle Ages with the people in the Arabian deserts as they used to play a game that was quite similar to Craps called Hazard or Azzahr. The definitive rules of this game were founded in the early 1700′s by Montmort. The roll that had the lowest value was referred to as crabs. While many believe this is where Craps got its name, others believe the word evolved from Crapeaud, which is the French word for toad. Other theories claim the French were trying to reclaim the game as their own and they took the English word Crabs and spelled it in French as Crabes. In the 1700′s, the game succeeded in crossing the Atlantic Ocean and reached Acadia, the French Colony. In 1755, the French lost their colony and the people of Acadia relocated to Louisiana. They brought the French game Crabes to Louisiana, but the game was called Creps or Crebs. By the year 1842, the terms Craps started to be the dominant term and is still the name that is prevalent to this day. 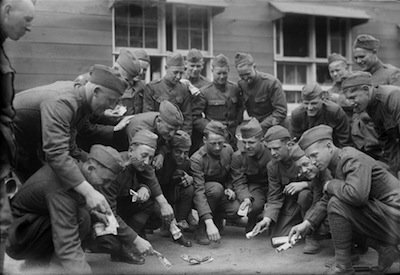 During the World War II, the Street version of the game was very popular and was played by the soldiers who used their blankets as the gaming surface. There was no wall to stop the dice from rolling out so they used blanket rolls to prevent the dice from falling. It is also important to note that the Craps version in modern America was brought by Bernard Xavier Philippe, who was a politician and a gambler. 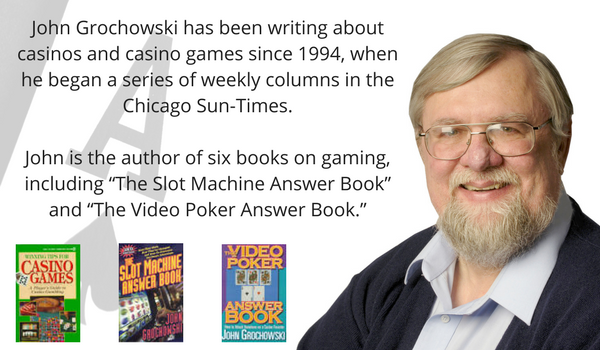 His version of Craps had a flaw that allowed players to exploit the game by taking advantage of the wagering system or by using fixed dice. This problem was fixed by John H Winn who introduced a new wagering option: “Do Not Pass”. This wagering option is used to this day in any casino that offers craps to its players around the world. As mentioned before, there are two types of Craps, we are going to discuss the gaming procedure of the most commonly played Craps version, Casino or Bank Craps. This version is the kind of Craps that is played at casinos, this is why in this game, players will place wagers against the casino. The payoffs of the game may differ from one casino to the next. In this game, players will take turns in rolling the dice. The player who is throwing the dice is called “The Shooter”. Before the shooter throws the dice, players will place their chips on the bets they want. They will find the different bets on a piece of cloth that is usually green; this piece of cloth has the different available bets printed. So players can easily place their chips on the bets they want to wager on. Players can go ahead and place their chips but there are some wagers that require players to ask the croupiers before putting them. 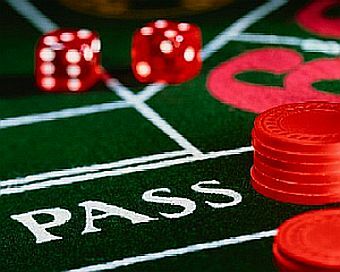 In order for a Craps player to be the shooter and get the chance to throw the dice, he has to be active at the table by placing bets on either the Pass line or the Do Not Pass line wagers at the table. These bets are also sometimes referred to as Right & Wrong or Win and Don’t Win bets. Players will roll the dice and keep passing it on in a clockwise direction. The player who is throwing the dice, the shooter, will roll his dice until he loses by getting a 7 or until his round is finished. The dealer in this game, also known as the Stickman is the person who represents the casino. He is called a Stickman because he uses a stick in order to collect the chips and move the dice around. The Stickman will present the shooter with 5 different dice and the shooter chooses 2 of them. The remaining dice will be placed in the bowl. There are numerous bet types that can be placed at the Craps table; we are going to discuss the most common one, the Line Wager. This type contains two bets; they are called the Pass Line and the Don’t Pass line wagers. The first one is a bet that the person shooting the dice will win. 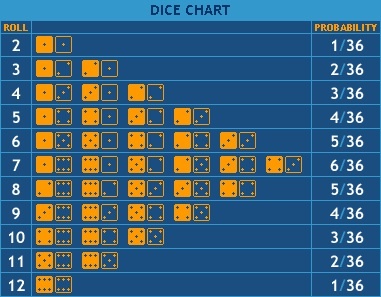 If the first roll which is also referred to as the come out dice roll comes out with a 7 or an eleven, then the dice shooter will win. If the dice is equal 2, three or 12, the shooter will lose. One the other hand, if the dice comes out with any other outcome than the ones mentioned, this value will be called “Point”. In this case, the shooter will have to throw the dice again. If he succeeds in rolling the same value of the point before rolling a 7, he will win but if he rolls a 7 before he rolls the Point value, he will lose. The other bet is called the Do Not Pass wager, it is the exact opposite. Both bets pay 1:1. The rules at the Craps table include the wagers and the payouts. Apart from these basic rules, there are other unwritten rules that casinos implement at the Craps table. If you are a new player, after knowing the basic payouts, rules and gaming procedure, you should get to know these etiquette rules because you will be expected to abide by them at any casino. 1. You are not permitted to handle the dice with your two hands. This includes shaking the dice in your hands before you throw them. Players are also expected to keep their hands within the surface of the craps table while they are handling the given dice. 2. The players who are throwing the dice are required to throw the dice and to make them hit the other side of the table. Rolls that do not reach the other wall of the Craps table are called Mellenberg Rolls. Some casinos allow these rolls if they get past half the distance to the other wall. Any dice rolls that do not hit the other wall or even get past half the distance will have to be repeated because these short rolls can be controlled to an extent. 3. Players should toss the dice and throw them on the table. They should not slide them. 4. If the thrown dice hit other players or the hand of the dealer and gets back to the table, they can be counted providing the players did not interfere with the rolled dice. Some casinos might take the easy way out and deem these no rolls and lets the player throw them again. 5. At some casinos, players will be able to call bets. Calling bets means they can place bets if they are waiting for their chips — they will call the bet and place it when they get the chips. Casinos that don’t allow such bets will have the words “No Call Bets” printed on the table of the game. 6. Casinos have the right to ask Craps players to leave the table at any given time without having to give any specific reasons. 8. Whenever players are offered the dice to shoot, they can give it to any other players at the table. 9. When players place service bets, which are bets that the dealers place for them, they should tip them. 10. Players will tip dealers by throwing the tip on the table and saying “For the Boys” or “For the Dealers.” Both of them work even if there are female dealers at the Craps table. Understanding and knowing the odds of the dice to get a certain outcome is the essence of Craps. If you are going to place real money wagers at a Craps table, it is essential for you to remember these odds. First of all, you will have a slight disadvantage when you place the Pass Line wager: the odds of winning are 970 out of 1980 times. In other words, the edge of the house for this wager equals 1.414 percent. The Pass Line wager has odds of 251 to 244, which is why players will be paid even money for this bet. The house advantage for this bet equals 1.414 percent. A Do Not Pass wager has odds of 976 to 949. It also pays even money and the house advantage equals 1.404 percent. – Betting on four or ten has odds of 2 to 1 and it pays out with the same rate, 2:1. – Betting on five or nine has odds of 3 to 2 and it pays out with the same rate, 3:2. – Betting on six or eight has odds of 6 to 5 and it pays out with the same rate, 6:5. All of these bets have the same house advantage that is equal 4.76 percent. – Betting on four or ten has odds of 1 to 2 and it pays out with the same rate, 1:2. The house advantage is equal 2.44 percent. – Betting on five or nine has odds of 2 to 3 and it pays out with the same rate, 2:3. The house advantage is equal 3.23 percent. – Betting on six or eight has odds of 5 to 6 and it pays out with the same rate, 5:6. The house advantage is equal 4 percent. All of these bets have odds of 5:4 and house advantage that is equal 2.78%. – Any Seven has odds of 5 to 1, pays 4:1 and it has a house edge of 16.9 percent. – Any Craps has odds of 8 to 1, pays 7:1 and it has a house edge of 11.1 percent. – 2 Craps and 12 Craps have odds of 35 to 1, pays 30:1 and it has a house edge of 13.9 percent. – 3 Craps and 11 Craps have odds of 17 to 1, pays 15:1 and it has a house edge of 11.1 percent. British casinos are tightly regulated and they offer better payouts on some of the bets. Craps is a dice game in which players will win or lose entirely depending on the outcome of the dice. There isn’t any skill or decision making involved in the game — it is purely about luck. There are no strategies or techniques to approach this game. Despite that, there are some betting tips that can help players minimize their losses and increase their odds. If you are a beginner, it is better to stick with the Pass Line Bet because the house edge of this wager equals 1.41 percent. The rest of the Craps bets at the table offer worse odds, so this is the best bet for starters. Although the Don’t Pass offers better odds as it has a house edge of 1.36 percent, it is frowned upon because you will be betting against the shooter and people will not appreciate that. It is safer to bet on the Pass Line wager because you wouldn’t want to antagonize and cross the shooter for a slight 0.05 percent advantage. The best bet in craps after the first roll is the odds bet. Once a point is determined, players will be able to place an additional wager that is a multiple of the pass line bet. The multiple differs from one casino to another, but the most common is 2X. The best thing about the odds bets is that it pays according to their true odds, which means the house has a 0% advantage; players should always take these bets. Stay away from the preposition bets. These bets are settled with one roll. Although the dealer might tempt you to place these bets, you should not because they have the highest house advantage. Players are also advised to tip the dealers at the Craps tables. This is not a bribe — in no way will the dealer interfere or affect the outcome of the dice. On the other hand, they can guide you and help you throughout the game. Dealers rely on these tips and they are a great part of their salary. Tipping the dealer will create a bond and you will receive invaluable advice that will help elevate the level of your game. Players should also read about the etiquette of craps and learn the unwritten rules of Craps. Some casinos will kick players off and ask them to leave if they are not following and abiding by these etiquette rules. 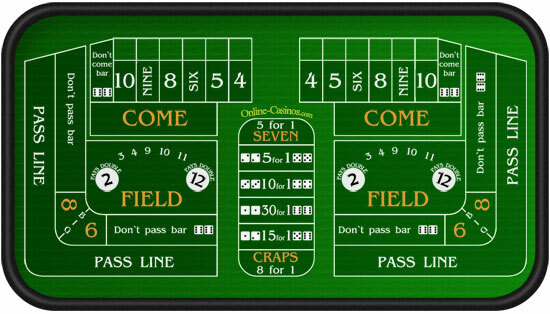 You can find out more about these rules at the “Rules” section of Craps on this website. Lastly, players are advised against taking tips from other players at the Craps table, no matter how tempting it might be, because the other players will not always give the correct advice. Players who take the house edge seriously quickly come to the conclusion that only a few bets are worth taking seriously. Pass or don’t pass and come or don’t come are the basics, and some players also like place bets on 6 or 8 despite a slightly higher house edge just so they can get the most frequently rolled non-7s working for them. One roll bets aren’t worth a second look. Why settle for an 11.1 percent house edge on any craps when you can bet pass at 1.41 percent? But given that a player is sticking with the best bets, the next question to arise often is, “Should I take the odds?” The answer depends on your bankroll and bet size. There is no house edge on the odds. Paying at true odds, they’re a rare example of even bets in a casino. To take the odds, however, you must bet pass or come, or don’t pass or don’t come, and those bets do carry an edge. If you’re a table minimum bettor, it’s between you and your bankroll as to whether you take the odds. Let’s say you’re at a table with a $5 minimum bet, and you bet that minimum on the pass line 100 times. You have $500 at risk. The 1.414 percent house edge means that at the end of the trial, the average house take from your $500 is $7.07. Now let’s say you bet the $5 minimum on pass and $10 in double odds. Per 100 trials, you risk $500 on pass and $1,000 on pass. The odds are a break-even bet, so on average, the house take is zero, while the house take on your pass bets remains $7.07. When results deviate from average, you can have much larger wins when you take the odds, and also much larger losses. But your average loss comes back to that same $7.07 with or without odds. Now let’s say you increase your pass bet to $15 without taking odds. Your risk per 100 trials increases to $150, and your average loss increase to $21.21. Here’s where it’s to your advantage to take the odds. Instead of increasing your pass bet to $15, leave it at the table minimum of $5, then use the rest of your intended bet increase to take the odds. That leaves your average loss at $7.07 while opening the door to larger wins. Many modern casinos offer more than double odds. Some offer up to 100x odds, and it’s become increasingly common for American casinos to offer 3x, 4x, 5x odds, meaning you can make an odds bet of three times your pass or come bet if the point number is 4 or 10, four times on 5 or 9 or five times on 6 or 8. Regardless of what odds the casino permits, the most advantageous play is to use the odds bet to keep your pass or come bet low, then to put more of your money in the higher-paying odds.